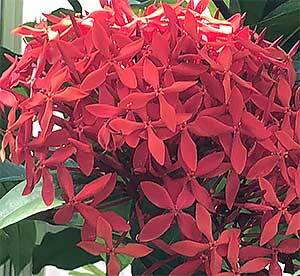 With colorful flowers and great foliage Ixora is a verstaile landscaping plant. Used widely in tropical and sub tropical climates and a flowering hedge or feature in a container these long flowering plants range in height from .5m to 2m. Very popular in Queensland to Northern NSW, however also grown as indoor plants or patio plants in Victoria especially the dwarf cultivars. Species such as chinensis are a tropical evergreen shrub originally from Asia. I. coccinea is sometimes referred to as the ‘Jungle Geranium’. They are also known as ‘West Indian Jasmine’ and will grow to 1m. Large flower heads on these plants are attractive for this tropical plant. I. javanica is a species that can be used as a medium growing hedge. I. coccinea is suited for lower growing hedges. Ixora ‘twilight glow’, Ixora Pink Malay, Ixora Coral Fire, Ixora ‘Goldfire’ and I. chinensis Prince Of Orange are all popular cultivars. These are a plant that need protection from frosts, for easy care and for growing outdoors they are best suited to warmer climates. A humus rich, moist but well drained soil is essential. Good sunlight is important and watering during summer will be required, cut back on water during the winter months. Yellow foliage on any of the species is an indication of lack of acidity in the soil, some gardeners have found these plants difficult to grow next to concrete paths where lime leaches into he soil. Ixora flowers are widely used in Hindu Temples and Ceremonies. Garlands are made from the flowers. These garlands are used in worship to the Gods. Traditionally these plants are also said to be used in Indian folk medicine (ayurvedic healing). In gardening most species are mainly used as ornamental or hedging plants in sub tropical climates.